Criminology Today: An Integrative Introduction, 8/e, continues to offer students a clear, contemporary, and comprehensive introduction to criminology that encourages critical thinking about the causes of crime and crime-prevention strategies. The textâs hallmark thematic approach of social problems versus social responsibility (Is crime a matter of individual responsibility or a symptom of a dysfunctional society?) prompts students to think critically about the causes of crime and helps them see the link between crime theories and crime policies. Updated with new information, theories, and statistics throughout, the Eighth Edition also includes new stories about Silk Road founder Ross Ulbricht, and the 2015 mass shooting at the Emanuel African Methodist Episcopal Church in Charleston, SC. A new Annotated Instructorâs Edition is available, allowing instructors to quickly and easily find helpful lecture notes, discussion ideas, and class assignments. 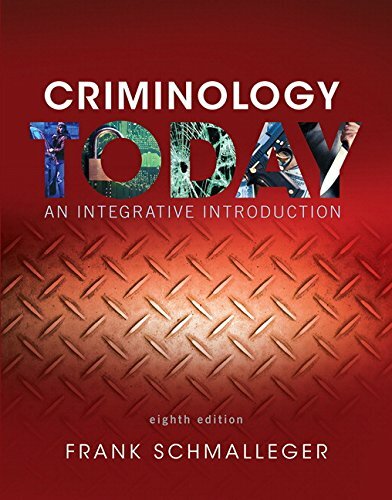 Criminology Today: An Integrative Introduction, 8/e, is also available via REVELâ¢, an interactive learning environment that enables students to read, practice, and study in one continuous experience. Learn more. About: A student-friendly, up-to-date, comprehensive introduction to the study of criminology. About: This text offers a student-friendly, up-to-date and comprehensive introduction to the study of criminology.